Colorful shoes have caught your attention at least once, we’re sure! But most probably, you have been doubtful about getting them since the outfit combinations that may be created with such pieces are comparably and seemingly few. But we have really awesome news for you! We are going to speak about the most diverse and interesting combination that can be created with rainbow bright shoes introducing combos with such shades as red, orange, yellow, blue, green, pink, purple, and just anything else! So gather all your attention and follow the style tips on how to wear rainbow bright shoes correctly! One basic rule about wearing bright shoes that you really need to remember is that the best alternative and principle of picking play pairs with colorful shoes is trying to be as monochrome as possible, creating the combinations within one and the same shade, of course, leaving some space for other color accents too in order to avoid boring monotone looks. The colorful shoes may also become the key elements for combinations created on the neutral background. For instance, they may act as contrastive play pairs for white, beige, dark blue, gray, black, or brown tones. If you have picked all the pieces according to any of these shades, then you have the widest choice for the shade, which enables you to pick just any bright shade for the heels you may think of! In addition, if you have opted for a multi-colored outfit, you may pick the shoes in accordance with one of those shades and it’s absolutely not necessary to find exactly the same tone. One more important thing that you should remember is that the more eye-caching and curious your outfits are, the more reserved your shoes should be. So this goes true for the reverse cases too, and the bright shoes can become a really great way to shift the focus of the look to them. This refers both to the style and the shade. So if you are not sure about the color combinations you can always turn to classics like in case of black and red, in case of which you may have perfect accents on red heels completing the enigmatic image of the black dress, also spicing up the look with classic red lipstick and matching all with the identical nail color. One more cool variant that you may try out is matching pearl heels with a brown dress and a pearl bracelet thus picking the bracelet as a tiny detail for entering into shade plays with the shoes. So the brushstroke that is to secure the color accordance should not get a dominant role in the combo, simply coming as a small accompaniment. For this you may use a kerchief, a scarf, a piece of bijou, a collar or any other piece of accessory. That’s why these details are called the keys of the combination. The abstracted alternatives with multi-colored designs are also having a moment among the design variants of rainbow bright shoes. As you might have guessed they require a bit more of consideration and delicacy, but still, the most important thing you should bear in mind is that you shouldn’t break the rule of three shades picking those three tones as keys for the whole combo. However, many stylists seem to go beyond this rule too, simply preserving the principle of matching cool shades with cool tones and the warm options with warm ones. Taking the occasion for which you are going to pick bright shoes into account is also quite important, since each event requires a special approach and a special range of options you may choose in between. 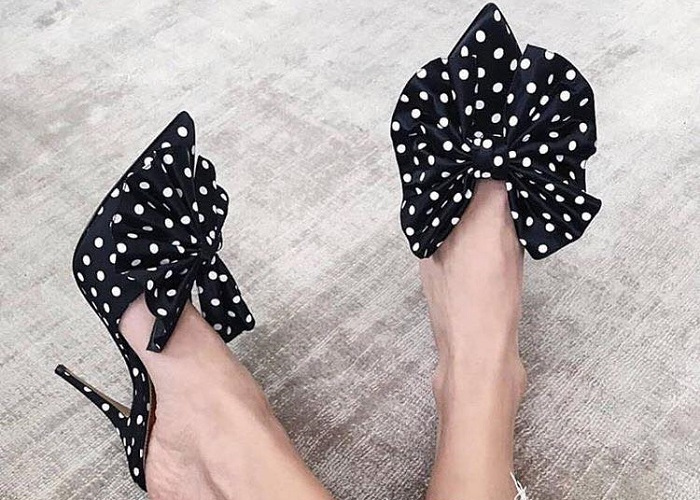 For instance, you can’t go for leopard printed heels for your office looks (check out: Best Office Shoes for Women) and the options with extravagant designs like feathery looks will not do for everyday combos. Still, if you manage to use these pieces correctly, you will manage to come up with really interesting looks. So being more precise, we can introduce the following looks for matching your bright shoes with! In this case you may opt for a contrastive combination with the pure white combo and the bold and catchy heels. White shade will prepare an ideal background for you to pick a personality stating pair of shoes. Matching that particular shade of shoes with the identical or close tone of lips and nails will get you to perfection. As we already noted color blocking (check out: Color Blocking Style Rules) is quite popular for matching the bright shoes with some catchy garments. So you may just pick a background shade for the combo, matching it with the shade of your shoes, preferably keeping the principle of three shades in order to avoid the overdosing of colors. Not going to extreme lengths with the extravagant shapes of the garments and the shoes is also important here. Finally, the last but not least important rule that you should bear in mind is that if you feel doubts about the effectiveness of the combination, you can always fill whatever is missing by means of properly picked accessories. Picking an accessory that matches the shade of the shoes will always secure your effective and chic looks no matter how tricky the choice of the shades may be. That detail can be a clutch or a necklace, but it should match the shade of the shoes to create the correct balanced look with the rest of the shades. Still, you should also remember that in any case you should not pick too many details for a single look, as picking bright shoes you already focus the attention on them and the excessive number of accessories and details will only distort the overall impression and the look that you are trying to achieve. There is a very widespread assumption about bright pieces being incompatible with office looks (check out: Fashion Tips for Modern Business Women). In fact, this is just a myth since even for such workplaces as banks or state institutions you can create some impressive and suitable combinations using bright things, particularly shoes. The only nuance that you should remember is that not all the saturated colors can be relevant for such combinations. Thus, for optimal choices you may stop on blue, green, and red alternatives. They are quite classic and traditional and despite the certain boldness that they contain, you can create some interesting looks using them. Thus talking about the general alternatives that might be created with bright office shoes, we can note pieces like pants, skirts and suits, pencil skirts, jeans, and other pieces of this type. Mostly they may simply act as a background for the overall color palette like it is in case of white options. Such sets will look quite laconic and cute. Combining the bright shades with the classic silhouettes and shapes is another cool thing that you can do. As for the combinations of the bright shoes with everyday looks, we may note that you have an even bigger freedom of choice in this case, being allowed to pick just any shade and combo you may like. You may thus combine your bright shoes with skinny jeans, any types of skirts and dresses, narrow pants, Capri ones, relaxed tops, T-shirts, jackets, tunics, leather jackets, and much more. The final image and the final combination depends on your personal style. For instance, the “city’ outfits look stricter for instance when being made of green shoes, romantic tones like pink, pearl or blue, while the street style allows practically all the shades and tones most frequently completed with a bright clutch, or a handbag, which doesn’t have to be the same as the shade of the shoes. The combinations with bright shoes created with the help of techniques like color blocking can also be included in the list of the dos. For such looks you just need shoes with clear spectral shades. Thus, here were the basic know-hows and the most essential tips and tricks concerning colorful shoes that we would like to present to your attention. What you should remember in any case is that the key of any look in general, no matter if it’s created with bright shoes or just a pair of sneakers, should be balanced properly. Otherwise you will not be able to avoid dissonance and overall failure, since every detail has to be in its place to secure the perfect outcomes. Still, this doesn’t mean straying away from experiments or being afraid of trying anything new. Just the opposite! Going for the craziest experiments will only help you to enhance the great arsenal of alternatives and cool looks that you might come up with. So using rainbow bright heels can become your key for having some fresh and different looks, surprising everyone with your creativity and energized looks once more. So don’t be afraid of buying the blinding pair of rainbow bright shoes you’ve recently seen, simply matching it right and enjoying the results! The Hottest Street Style Looks From PFW That Will Make You Go WOW!